On 2 July 1938, Minister of Railways Dan Sullivan and Wellington Mayor Thomas Hislop officially opened the electrified rail line between central Wellington and the northern suburb of Johnsonville. The Wellington and Manawatu Railway Company had originally built this steep, winding line in 1886, and, until 1937, it was part of the main trunk route out of the capital. Following the completion of the Tawa Flat deviation that year, the bypassed Johnsonville section was truncated and converted into a suburban route. 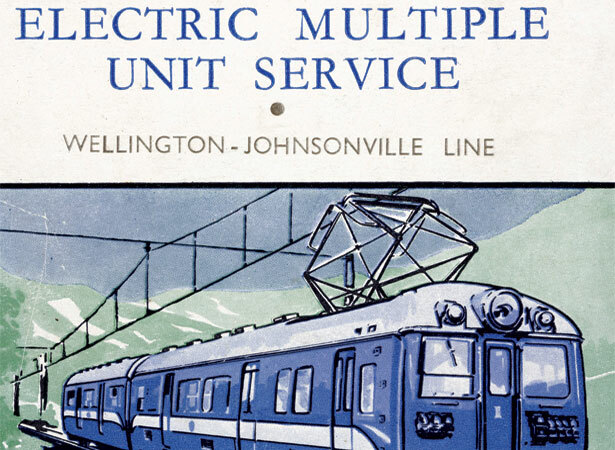 The line was served by sleek, modern English Electric DM-class multiple units, the first of their kind in New Zealand. As the city’s electrified rail network expanded during and after the Second World War, DM units were used on the Kapiti and Hutt Valley lines. Most were replaced in the 1980s following the introduction of Hungarian-built EM-class units, but a number of refurbished DMs continued to serve the Johnsonville line. These units, some of which had been in service since 1949, were finally retired in 2012 when new South Korean-built Matangi units took over the route. We have 1 biography, 10 articles, related to Electric trains come to Wellington.